Is Olympics fever inspiring you to try a new sport? Or just do something active? Marie Claire goes for gold in the great British countryside. Being blessed with neither the stature nor the hand-eye coordination of a natural sportswoman, I have some reservations about learning beach volleyball: Will I be any good at all the running around? If I actually manage to hit the ball, will it hurt? And will I ever be able to get the Baywatch theme-tune out of my head while I’m doing it? To sample the sport that originated on the sun-soaked beaches of Santa Monica, I am sent to the California of the West Country: Croyde. Accompanied by three girlfriends (all with better ball control than me), I’m spending the weekend at the delightful Ocean Point cottages overlooking Saunton Sands. Our instructor is former GB player Denise Austin who coaches everyone from complete beginners to budding international players. She starts us off with the basics: Digging (passing the ball), setting (serving it) and spiking (smashing it into your opponents’ court). To move more easily in the sand, we’re advised to go barefoot and scuttle from side to side. ‘Like a crab?’ I ask. ‘Exactly,’ says Denise. Getting the ball over the net is the next challenge. Denise tells us to hold our arms straight ahead and nudge the ball upwards with a shrug. When she does this, it looks easy and makes no sound. When I do it, there is an almighty ‘thwack’ and I am in agony. Denise runs through the move again and after a few practice shrugs, Tommy Cooper-style, I finally get it. Volleyball Eureka! After a shower to remove the sand that’s found its way into every imaginable crevice, we’re revived but famished. We fall upon some surprisingly upmarket pub grub (ostrich burgers or venison steak, anyone?) and down a few glasses of post-match Pinot Grigio before bed. The next day is spent reminiscing about our sporting glory whilst eating ice-cream (the food of Olympians) on the beach. A good old-fashioned seaside break and the chance to get in on the Olympic spirit, this trip wins gold. Top tip: Get your technique right to avoid injury (but pack the Arnica just in case). Learn more: Check out gospike.net – Volleyball England’s grass roots campaign and the best source of information for people in England who want to try out volleyball or beach volleyball for themselves. You can also find info at volleyballengland.org, scottishvolleyball.org, volleyballwales.org. 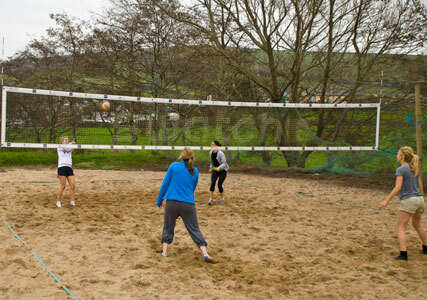 Book now: Denise Austin (beachvolleyballinc.com) offers expert coaching to groups and individuals year-round, from £35 an hour. 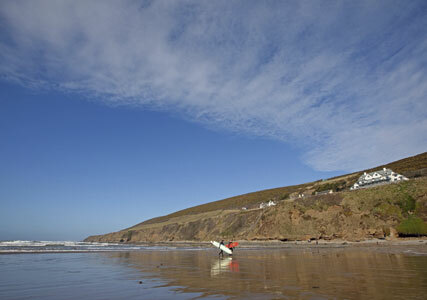 Farm & Cottage Holidays (holidaycottages.co.uk) has beach properties near Croyde – in June a week at Ocean Point, sleeping four, costs from £875.